Doctor Who: The Doctor's Christmas Job! | Warped Factor - Words in the Key of Geek. 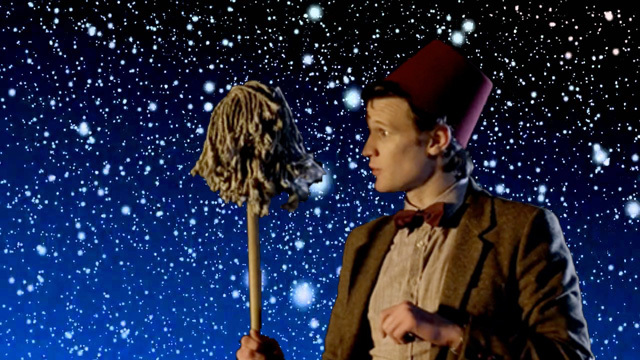 Doctor Who: The Doctor's Christmas Job! Is it possible to both be a hero and maintain a regular career? Like many of us, even the Doctor found himself with a Christmas job, of sorts, in The Doctor, The Widow & The Wardrobe as the caretaker of the lovely old house in Dorset to which Madge Arwell & family flee to escape the horrors of the Second World War. MADGE: But you're not Mister Cardew. MADGE: I don't understand. Are you the new caretaker? DOCTOR: Usually called the Doctor. Or the Caretaker or Get Off This Planet. Though, strictly speaking, that probably isn't a name. We might reasonably wonder if he's got something of a fondness for janitorial work - having first pondered the possibility of picking up a brush and getting to work battling sinister puddles during his Seventh incarnation as part of his plan to keep tabs on the Hand of Omega! HEADMASTER: And you would be? DOCTOR: The Doctor. And you? HEADMASTER: I'm the Headmaster here. Doctor, eh? Well, you're a bit over-qualified for the position, but if you would like to leave your particulars and references. HEADMASTER: You are here for the job of school caretaker? At first, he turned down the chance to become Coal Hill School's resident mop-wielder, but by the time he was once more Scottish, darker & a bit more mysterious, though, he would take the position with gusto, in part of what we might term a mini "The Doctor Gets A Job" arc by Gareth Roberts - the man who also gave us The Lodger & Closing Time for the Eleventh Doctor. Nothing like whistling while you work, eh? DOCTOR: I'm the new caretaker. John Smith. DANNY: Welcome to Coal Hill, Mister Smith. DOCTOR: Thanks. Yes, John Smith's the name. But, you know, here's a thing. Most people just call me the Doctor. So, if anybody needs me, just, you know, give me a shout. I'll be in the storeroom just getting the lie of the land. Like his earlier flirtation with the idea of becoming one of the unsung heroes in the battle against untidy schools, the whole thing is but a cover for a bigger operation in his eyes. He is of course tracking the Skovox Blitzer, having swapped his usual attire for a fetching brown jacket! "The walls need sponging" into the bargain. Good job he brought his faithful blue box along for the ride. After all "Every caretaker has their own box". Fittingly for a man with many lives though, career-wise he's not confined himself to caretaking. Roberts' first effort to give him an ordinary workaday nine to five saw him swap all of time & space for a call centre in Colchester! DOCTOR: I think that's not what my screen is telling me, Mister Lang. CRAIG: What's he doing here? What are you doing here? DOCTOR: If that's your attitude, Mister Lang, please take your custom elsewhere. CRAIG: No, no, no, that's one of my best clients. DOCTOR: Hello, Craig. How are you feeling? Had some time to kill. I was curious. Never worked in an office. Never worked in anywhere. Except that last bit isn't actually strictly true, is it? He had once been employed as UNIT's scientific adviser, Brigadier Lethbridge-Stewart serving as his boss until he rediscovered the secret of the TARDIS, regenerated and decided he had better things to do than run around after his old friend now that it was indeed a free cosmos. Given that he hadn't asked for money, the man whom the much changed Doctor had once described as a pompous, self-opinionated idiot had proved himself a remarkably flexible employer. After all did he not grant his new man "facilities to repair the TARDIS, laboratory, equipment, help from Miss Shaw" as well as perhaps the ultimate company car in the form of Bessie while allowing him to indulge an undimmed thirst for adventure? His bescarfed years would of course be fondly remembered during Closing Time, after he "Saw a shop, got a job" & met Yappy, who reminded him of someone. "The robot dog. Not so much fun as I remember". It could be argued that this was his best career choice, working with children in that department store in Colchester, for he knew his target market well. "It goes up tiddly up, it goes down tiddly down for only forty nine ninety nine, which I personally think is a bit steep, but then again it's your parents' cash and they'll only waste it on boring stuff like lamps and vegetables. Yawn!" 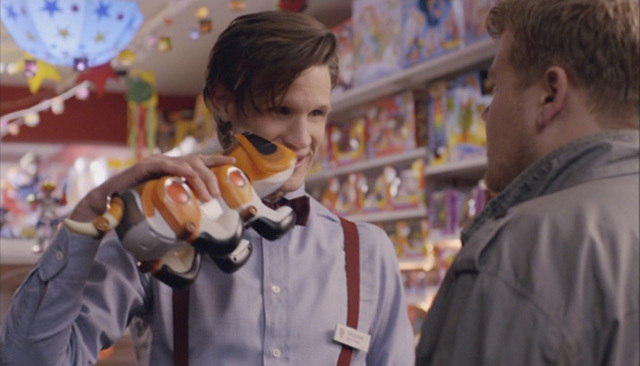 The Doctor wouldn't spend his wages on anything like that now, would he? Then again, when it comes to wages, he states "I don't want money. I've got no use for the stuff." But he'll have oodles of it by the time he comes to rent a room with Craig Owens, though. "Yes, quite right. Have some rent. That's probably quite a lot, isn't it? Looks like a lot. Is it a lot? I can never tell. Don't spend it all on sweets, unless you like sweets. I like sweets. Ooo."